The past few Mondays, I've reviewed meals from Munchery, a meal delivery service in San Francisco. Since they only deliver in the evenings, I've generally ordered from Munchery for dinner, but they also make great desserts, and we even got our Thanksgiving feast from Munchery. But they also have muffins. And you know how much I love baked goods. I've had my eyes on these muffins since they first appeared on the menu. They are one of the highest rated dishes on Munchery, averaging 5 stars! Everyone raves about them. And Ojan loves blueberry muffins, so they sounded perfect. But, I didn't want to order *just* muffins for delivery, as that feels a little silly. So, the moment I saw that they were on the menu the same day we ordered our Thanksgiving feast, I quickly added them. Since I've reviewed Munchery many times before, I'll skip all of the general details, but if you haven't checked it out already, I highly recommend it - perfect for weeknight easy meals, and so, so much better than standard delivery. If you use my invite link, you'll even get $20 off your first order. While I wouldn't order from Munchery just to get muffins, they are perfect for adding to a dinner order and enjoying for breakfast the next day! The muffins are made by Chef Emily Guzzardi. 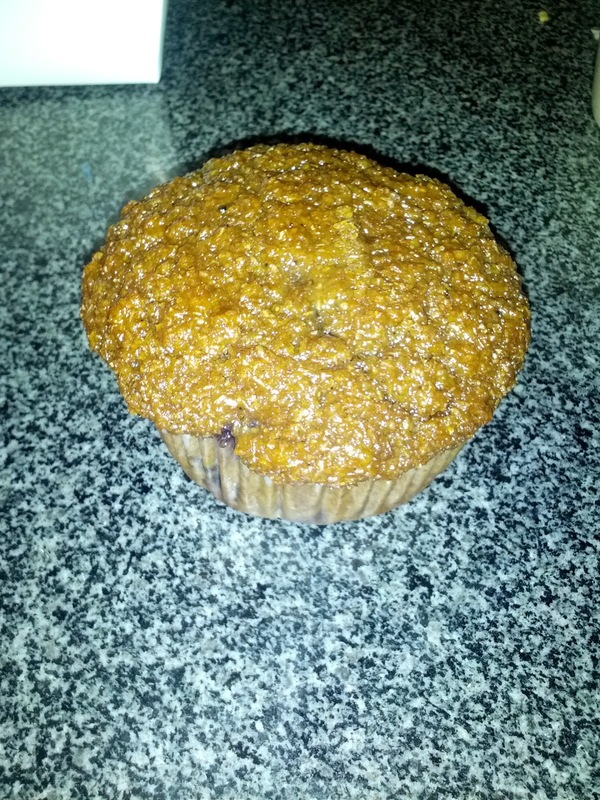 I was amazed when I pulled the muffin out of the box - it was a hefty muffin! Not only was large in size, particularly in diameter (although fairly short), but it was also incredibly dense. I planned to save it for breakfast, but I couldn't resist trying a bite (ok, perhaps two) the night I received it. It was very moist, almost a bit gummy on top however. The slight chew from the whole grains and wheat bran made it texturally interesting to eat. It wasn't overly sweet, not one of those cakes masquerading as a muffin. There was sweetness, but it stayed on the healthier, not-unreasonable-for-breakfast side of the spectrum. My very first tasting note is that I tasted molasses, which I confirmed when I later read the description. 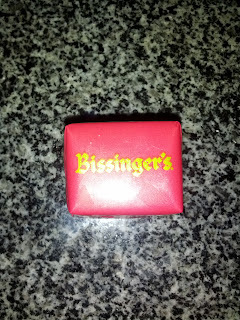 The molasses flavor was strong, and such a more interesting sweetness than standard sugar. And of course, there were blueberries. The berries were plump berries, large size, generously distributed. Very good. The next morning I had the rest, and warmed it up in the toaster oven. I liked it even more warm, and even more once I slathered on some butter. I again loved how it wasn't too sweet, it was hearty tasting, and really did the blueberries justice. A healthy but satisfying start to my day, it left me filled up easily until lunch. I shared some bites with Ojan, who loves blueberry muffins, but dislikes bran, and he enjoyed it as well. He didn't care for it cold, but exclaimed several times how much better it was once warm. Price was about standard for getting a bakery, so I see this as a great add-on whenever ordering from Munchery. I think they'd freeze well too, so could be worth ordering a few at a time to pull out whenever the muffin mood strikes! 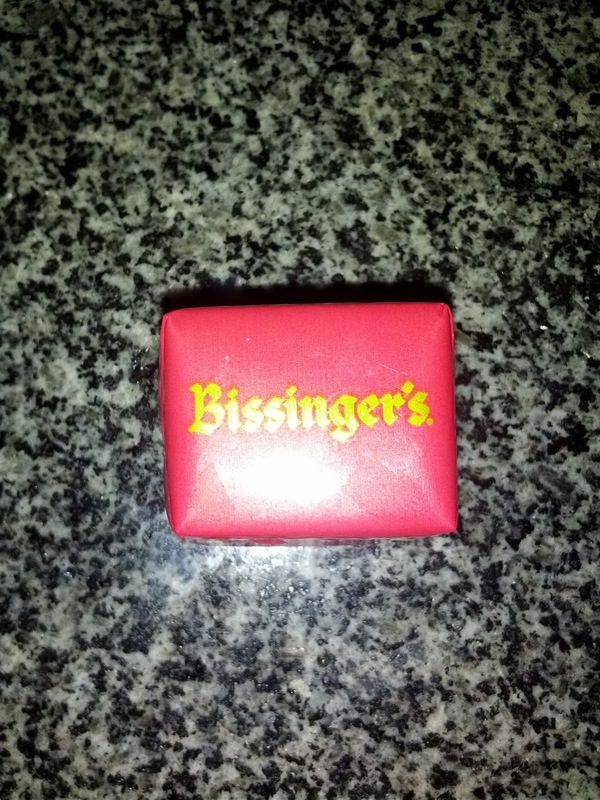 Bissinger’s is a chocolate maker with quite the history, as in, they have their roots in 17th Century France. They make an assortment of bars, chocolate, caramels, etc, however my exposure is quite limited, as I just received a small box of plain dark chocolate for Christmas. It was quite good, so I look forward to sometime trying more of their selections. This was fairly complex, bitter yet with some fruit notes. Very solid, thick chunk, making it a bit hard to bite into. But overall, quite good. Subsequent tasting: Really complex, smooth, nice dark chocolate. I'd gladly eat more of these!